Last week, the San Luis Obispo Council of Governments board voted 10-1 in favor of the tax increase. County Supervisor Debbie Arnold cast the lone dissenting vote. Supervisor Lynn Compton was absent for the vote. The tax proposal would last nine years and raise approximately $25 million annually. Two thirds of voters would have to support the initiative in order for it to pass. Ron De Carli, executive director of SLOCOG, said the agency is at a fiscal cliff because of low gas prices. State and federal transportation funding have decreased significantly in recent years because of low gas prices and the increasing popularity of fuel-efficient cars. 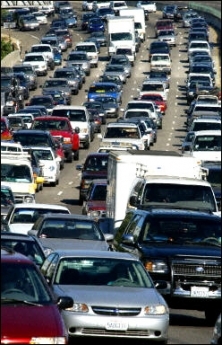 County officials say a new source of revenue is needed to reduce traffic congestion. Congestion has long been a problem at rush hour on Highway 101 at the Shell Beach Straights. Alternative routes on Highway 227, Prado Road and Los Osos Valley Road are becoming backed up as well. If the tax were to pass, the revenue would go toward widening roads, but also fixing potholes, improving bridge safety and improving bike paths, like the Bob Jones trail. In order for the tax measure to qualify for the ballot, it must be approved by a majority of San Luis Obispo County cities and the county board of supervisors. SLOCOG officials say telephone polling currently puts support for the tax in the mid-60 percent range. The process to place the Self Help County Sales Tax Proposal on the November ballot has begun. The City Council of Morro Bay is the first of the seven cities in the county to have the issue on its agenda this evening. I am anticipating it will be approved by the council due to Mayor Jamie Irons support at SLOCOG. It’s time for robotics in government. Replace the stubborn ideological over spending dishonest humans with robots. Then they can see how we feel when our jobs move away. Nation wide tax revolt is on it’s way. The real stupidity of this is these people don’t understand basic economics. We have an economy driven by consumption. If you tax consumption, and people only have so much to spend (which is true for most of us), that means we consume less, the economy gets weaker, and all of what follows from that happens. If you want to boost the economy, a consumption (sales) tax is the last thing you’d want to do. So much for the brainpower of the local genius class. Great point. Government has never been able to fathom that tax revenues can actually increase when taxes are lowered. They need more money to waste so they do the simple math and figure out how much to raise taxes to get that money assuming sales remain equal. What they don’t factor in is as taxes increase we have to spend less or choose to completely avoid the tax by not shopping locally. Facetiously, could this also include a barrier to separate the bike “lane” from the automobile “lane” so they won’t ride on the white line or into the automobile lanes and expect us to adjust to their breaking the law? Wait a minute, these law breaking Timmy Ten Speeds don’t pay for any license fees to the DMV to operate their mode of transportation, but we’re to pay in their behalf so they can clog up the roads and walking paths? How about putting speed signs on the walking/bike paths so the bicyclists won’t come around the blind turns at 30mph, and expect grandma on a Sunday afternoon to get out of their way post haste? How many close calls have there been in this respect? Who came up with the idea of bike lanes in the first place? I want to send them a present that my two dogs give me daily on my backyard lawn. Wouldn’t Jesus ride a bike instead of a donkey if he were around today? Wait, you have dogs? How come I have to pay taxes into the system and fund an Animal Control Officer just to take care of your dogs? And no, your piddly $26 fee does NOT pay for our website, vehicle, offices, clerk, or our poop bag programs. Just as ridiculous as that argument is yours Ted. Roads are shared by all. The other ridiculous part of his argument is that those who ride bikes also drive cars so they pay all the same fees. You want to tax them more and get them back into their cars. It’s why you see those bike racks on SUVs all of the time. That and the fed govt pushes for bicycle use as transportation partly for a cleaner environment (less commuters, less congestion, lower emissions), partly to reduce wear and tear on roads as a 30 lb bike does a lot less damage than a 2 ton vehicle, and to encourage our obese society Not to be so fat and disgusting. Stick to bible thumping Ted. Yet another tax to pay for the rampant incompetence exhibited by a number of county officials????? No thanks.